Well, I have to say, if you’re looking for a new chilli recipe, this surely has to be the place to come. When I first launched The Spice Trail challenge, I wasn’t sure what take-up would be like. 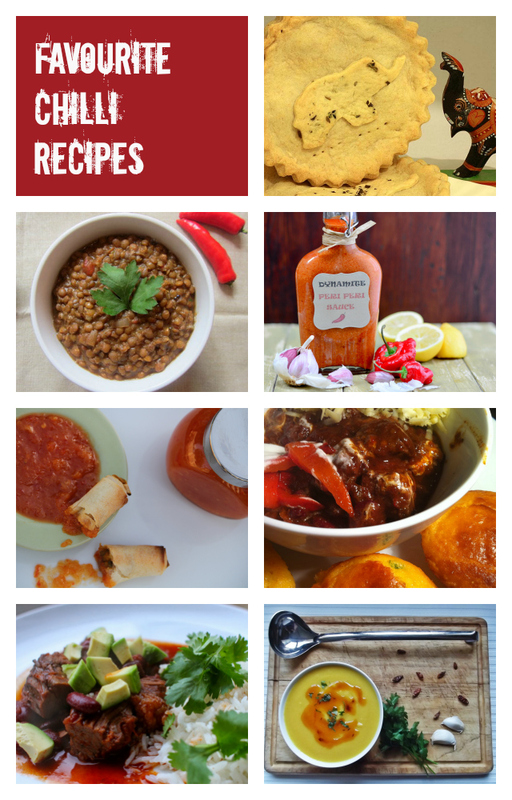 I know how much I adore cooking with spices, but what about the rest of the blogosphere? The answer, it seems, is just as much as me. If not more. This round-up of the first challenge in The Spice Trail is an incredible celebration of cooking with chilli, taking us all over the globe. From tagines and tarts, pies and pasta, to sweets, soups and salads – it’s all here. Slow cooked beef brisket with garlic, chilli, pepper, tomatoes and paprika. You can just tell that meat is going to melt in your mouth, can’t you? A fresh and tasty oriental salad featuring chicken thighs, fish sauce, garlic, chilli and lime, plus lots of crunch raw veggies, peanuts and coriander. A wonderful combination of flavours and textures. Just like Diwali, this frozen yoghurt is a feast for the senses, combining sweet with sour, chilli heat with chiller cool, and a touch of cinnamon perfume. And it looks pretty as a picture too. According to Deena, her dipping sauce is as good with chips as it is spring rolls and “carries an exotic aroma, has a zesty and hot kick and is cheekily sticky.” If you like it hot and sweet, this is the sauce for you. So what’s a chilli oil with an Indian accent? Think garam masala and you’ve got the spice mix right there, giving this oil a wonderful aroma and gentle heat with just the right level of sweetness. Truly inspired. This tasty slow cooked tagine is perfect for cheaper cuts of meat and a great way to ‘sneak’ vegetables passed unsuspecting little ones. And what’s more, it’s absolutely packed full of rich, intense flavours for a different take on the traditional Sunday lunch. Harissa is a versatile chilli and garlic paste originating from North America, ideal for spicing up soups, stews, cous cous and rice dishes. When you’ve seen Chef Mireille’s homemade version, you won’t want to buy shop-bought again! Having never eaten persimmons, I am intrigued by these beautiful tarts, particularly as they also feature white chocolate flavoured with naga chilli. I am a big fan of chilli chocolate but generally find the flavouring is a little on the timid side. Naga chilli chocolate sounds right up my street, providing the perfect foil for the gingery persimmon custard in these tarts. When you take a look at this curry, you just know it’s going to taste good and make you feel good. Simple lentils with exciting flavours: coconut, garam masala, curry powder, ginger, garlic and, of course, chilli. Plus it’s so incredibly easy to make; it’s one of those pop everything in the slow cooker numbers and simply leave for a few hours. “Now repeat after me,” Bintu instructs us. “I will go shove everything into my slow cooker and then make time for me, four whole hours for me, me, me…” You have been told! Here’s a gorgeous “no-nonsense” lamb curry originating from South Africa, just like its creator Angela from The Golden Pear. It’s a sweet and spicy combination of punchy flavours – garlic, ginger, curry powder, chilli, apricot and cinnamon. Lamb with fruit and cinnamon is a fantastic combination – I really look forward to trying this one out on my family. This soup has gone right to the top of my ‘must make’ list. It originates from Africa and wherever African slaves were transported, you’ll find a version of this peanut soup. As well as plantain, it also features okra and green beans and a whole heap of tasty spices, and looks like the perfect dish to warm you up on a chilly night. How about this for a hearty pasta supper, with big chunks of tender, melt-in-the-mouth beef and packed full of spicy flavours? An easy-to-cook, one pot wonder you can stick in the slow cooker in the morning for a wonderfully satisfying meal all ready and waiting for you when you get back from work in the evening. Sounds good to me! Here’s my mum’s take on a Spanish paella. It’s incredibly moreish and very, very tasty with an extra kick from some fiery red chilli. It’s not exactly a traditional paella, but completely gorgeous nonetheless. While I’ve seen chocolate and chilli come together in all kinds of dishes, I’ve never seen them together in a bread, and a savoury bread and that. But I am completely intrigued by the idea and will definitely have to give this bread recipe from Jen at Blue Kitchen Bakes a whirl very soon. If you ask me, parsnips and spices are a match made in heaven, and these cute little samosa pies look absolutely heavenly. These would be lovely for lunchboxes or picnics (dreaming of warmer weather) and I think they’d make a splendid addition to any buffet table this Christmas time. Pasta with meatballs is my idea of the perfect comfort food, especially with the addition of a little chilli to heat things up a bit. And this entry from Corina at Searching for Spice looks like just the kind of bowl of meatball loveliness I could dive straight into. Here’s another beautifully spiced soup, this time from Chef Mireille in New York. It’s a delicious way to use up vegetables lurking in the fridge, and using crispy fried slices of sweet potato as a garnish is an excellent finishing touch. My next offering is another spicy pasta dish, which I came up with for the £3 Cooking Challenge in support of the food charity The Trussell Trust. Chillies are a great way to add flavour to a dish when you’re on a tight budget. This is such a fantastically evocative entry, with its talk of campfires and cowboys. While I’m not much of a camper, I can quite easily imagine sitting beneath the stars beside a roaring bonfire, tucking into this scrummy, cheesy cornbread as someone serenades me on a ukulele! I was hoping someone would enter a chilli con carne this month, as it’s one of my all-time favourite chilli dishes, and Ness from Jibber Jabber UK has come up trumps. She describes it as the perfect Friday night meal for sharing with friends and family: “big bowls and happy memories.” Serve me a big bowlful of this chilli con carne and I’d be very happy indeed. There is something just so satisfying about baking and glazing your own ham, and the idea of using a chilli-flavoured honey for the glaze has me practically drooling. I tried Luchito Honey recently in a fruit crumble and can vouch for the fact it is quite delicious. This would be a great way to prepare your ham this Christmas. Stacey’s spicy soup looks like a hug in a bowl but it is the spiced tadka, with caraway, paprika, garlic, parsley and chilli, that I really want to try. Next time I make a soup, I’ll definitely be preparing some tadka to drizzle on top. Oh yes! I recently got my mitts on a copy of the Higgidy Cookbook and this chilli beef pie was the first recipe I tried. It is absolutely delicious and the idea of topping a stew with crispy wedges is truly inspired. I can’t wait to work my way through the other dishes in this book. Don’t you think these wholesome baked beans, flavoured with honey and a generous pinch of chilli flakes, would make a marvellous accompaniment to Fromage Homage’s cornbread above? I’ve wanted to make my own baked beans for ages, and now I think I’ve found the perfect recipe. Here’s another take on one of my favourite dishes. Keith, aka the Reluctant Housedad, has come up with not one, not two but three twists on the classic chilli con carne. He has used chunks of meat instead of the more familiar mince, a spiced butter at the end of cooking, and the unusual addition of Chinese black bean sauce; not an ingredient I’d have thought of using myself but I can imagine it works well. Very well indeed. Every food fair I go to I seem to end up with another bottle of chilli sauce to add to my ever-expanding collection at home. But no more. I have decided the next bottle of chilli sauce that makes it into my kitchen will be the homemade variety, and I now have two very tempting recipes to test out, starting with this vibrant peri peri sauce from My Golden Pear featuring no less than 20 hot chillies. My tongue is tingling in anticipation! And here’s the other chilli sauce I can’t wait to cook up myself – this time a scotch bonnet sauce from Sarah’s Kitchen Shed, which she made with her own homegrown chillies. My husband is also a keen chilli grower so we have a regular stock of chillies here at Chez Bangers, and what better way to make the most of a chilli glut? Sarah used to sell her sauces to a local Mexican restaurant, so her recipe comes highly recommended! I have been enormously impressed by the sheer range and diversity of chilli recipes entered into this first month of The Spice Trail, providing so many hot and spicy dishes to satisfy my chilli addiction for quite some time to come. But there can be only one winner, and I’m very glad it’s not down to me to choose. That unenviable task went to Bryn Davies, one of the directors of Kitchen Nomad. It was a tough decision but I think the lamb curry from My Golden Pear has to win – it looks delicious! – closely followed by the honey glazed ham by Eat Your Veg. So congratulations to Angela at My Golden Pear for winning the inaugural Spice Trail challenge. Drop me a line as soon as you can so we can arrange for your fantastic prize of a Mexican Kitchen Nomad recipe box to be sent out to you. And congratulations also to Lou at Eat Your Veg for coming in a very close second. Thank you to everyone that took part this month in the chilli challenge. The theme for December’s Spice Trail challenge will be announced very soon so watch this space! Great collection of recipes. Love the look of Slow Cooked Mexican Style Beef. Wow what a fabulous round-up of chilli delights for your first challenge Vanesther – it seems it’s not just you and I that are chilli fiends. Both of the chilli sauces look good and very different. I make my own too, but we’ve not had any chillies this year – or not yet anyway. Wow! Thank you for featuring me!!!! !